Simple, straight-forward, practical guidance on what to say and how to say it; so you can build competence and confidence to move forward with conversations that feel complex, difficult or even impossible. What conversations are waiting for you? How does defensiveness show up for you? Chris Trani is an independent coach, consultant and facilitator who helps people build competence and confidence to have conversations they assess as complex, difficult - or even impossible. 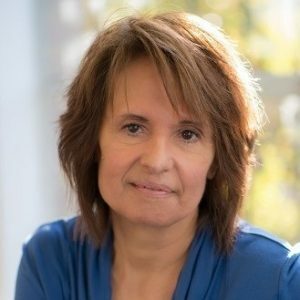 Drawing on over 30 years of experience, Chris leverages her background as an oncology nurse, a manager, a counselor, a management/leadership development consultant, a corporate leadership and communication coach and, a mindfulness facilitator to bring a breadth of experience to her clients. Today Chris offers a wide range of customized programs and services aimed at building conversational competence. Chris is a remarkable coach and trainer. Our relationship with her started a few years ago when a colleague recommended her for a coaching assignment we were considering for one of our executives. Her listening and communication skills are what sets Chris apart from others. She has the ability to see to the heart of the matter and ask the right questions to allow the coachee to realize the truth of the situation. This initial coaching arrangement was successful and it led us to engage Chris to develop a course for us called “Leadership . . . The Art of Having Conversations that Matter”, which focuses on the importance of communication as a leadership competency. We’ve now put a few dozen high potential leaders through this course and their feedback is enthusiastically positive. Chris quickly establishes relationships and this enables our leaders to feel safe in her coaching/teaching environment and to be open minded to the techniques being taught. The simple model Chris teaches for having different kinds of conversations has made a huge difference in the abilities of our future leaders. Chris is a trusted partner for our company. Division Vice President, Extra Space Storage Inc.
Chris Trani is one of the most masterful communicators I have had the pleasure of knowing personally and collaborating with professionally. She brings extraordinary awareness, skill, compassion, integrity, experience and effectiveness in helping people move forward in their lives and work; especially when navigating difficult and complex conversations. In addition to her ability to facilitate highly-meaningful conversations — even in the most sensitive situations — Chris maintains an unwavering intention and focus that those conversations lead to tangible results. She helps her clients discover the clarity and confidence needed to take appropriate and meaningful action, and experience new and unimagined possibilities. In addition to being a truly dedicated professional she is a deeply wise, kind, and caring human being — a very rare and special combination in this world. It is a joy and honor to work with Chris. I give her my highest recommendation. Author, "The Journey Through Cancer: Healing and Transforming the Whole Person"
Chris Trani… committed, supportive, forward-looking coach. I sought coaching with Chris after starting a new position with a consulting firm, in a new field for me. Initially, I simply wanted another perspective on how I made impressions with clients and a new employer. However, in my work with Chris, I also realized I needed help having tough conversations with a variety of people important to my work – including those who held sway over my assignments and managed my work. She helped me initiate these kinds of conversations sooner and broach difficult topics more skillfully which resulted in different, more desirable outcomes that I had been experiencing. What I like best about working with Chris is her ability to get me to focus on what I want while putting it in terms people can hear. Knowing what I want to accomplish and how to make my views heard without sacrificing the relationship has made a significant difference for me in my work. Clear, relevant, practical, effective. This is how I often describe Chris and the solutions she brings to her clients. I searched for months to find a presentation coach that I would be comfortable and confident in bringing to my own executive clients. I hit the jackpot when I found Chris. She really understands what it takes to assemble a great presentation and deliver it in a way that rises above the clutter. But it’s also her willingness to jump in quickly and learn a new industry, her natural skill at putting my clients at ease, and her openness in both giving and receiving feedback that makes her a great strategic partner. It is without reservation that I give Chris the highest possible recommendation. Chris Trani has been – and continues to be – a profound and transformational influence in my life. In both professional and personal situations, I’ve come to Chris when faced with difficult conversations and complex issues I knew I had to work through, but felt uncertain about how to approach them. In every session with Chris, she has brought an almost magical ability to zero in on what most needs resolving within a particular issue. While I could focus on her incredibly astute questions, bone-deep practicality, great listening skills, or her encouraging and fun approach, it’s her unique consciousness that sets her apart. Chris is so internally clear and present, and offers her work from such a deep place of stillness. It is from this place that the solutions for a challenging conversation or issue become obvious. Chris Trani is a great gift in my life, and I am extremely grateful to know, work with, and wholeheartedly recommend her. I came to Chris while navigating the tough waters of a failing relationship thus feeling frustration, sorrow, guilt, exhaustion and fear. Chris allowed a safe space for me to share difficult personal reflections and uncertainties and also gain a better understanding of the intricacies of the issues my spouse and I were dealing with. Throughout my work with Chris, I was able to clarify my needs, explore the places where I needed to communicate more effectively and discover tools to move in a progressive manner towards resolution. The coaching Chris provided will forever empower me to face difficult conversations and to discover possible paths through seemingly impossible situations. I have been working with Chris intermittently since 2008 for guidance on a range of business and personal issues. I appreciate that I can reach out to her whenever the need arises, re-engage with her quickly and get just what I need when I need it. Chris offers clear, concise and actionable guidance for navigating difficult decisions which have often required hard conversations including, at times, facilitated conversations. Her advice was key to supporting our successful business transitions and fostering personal growth at many levels. I turn to Chris for help with strategy, clear-seeing and conflict resolution. She is a tremendously valuable resource and I deeply trust her good counsel. Chris is a treasure of a resource. In addition to her wealth of experience, Chris offers an abundant toolkit of practical strategies to help with mediating conversations, change, and growth between individuals, or in the context of much larger groups. She is adept at helping people to clarify their thoughts, concerns and desires and express them such that they can be heard and received. Always a calm, warm, and professional presence, Chris is uniquely skilled at offering focused critical feedback in a compassionate way that encourages growth and development instead of defensiveness. The very practical strategies for communication, teamwork, and relationship building that she shared with me many years ago are still ones that I reflect upon and use today. I have had many opportunities to benefit from Chris Trani’s expertise as a meeting facilitator. It’s unique in my experience to have a facilitator engage people with differing views in a manner that results in honest discussion of difficult topics. Chris is exceptionally good at this and it results in meaningful dialogue and communication. It is my pleasure to recommend Chris. Chris spoke at a conference I attended in 2007 and I was so impressed with her ability to coach people through difficult situations and conversations that I soon hired her as my coach. Chris has been a source of overwhelming support for me for many years now. I always feel better, clearer after our conversations. She has an uncanny ability to listen between the lines and get to the root of any difficulty, followed by clear suggested next steps. I am eternally grateful for Chris’ insights. Her compassion, humor and good spirit have been a blessing in my life. My husband has also benefitted from her expertise. He worked with Chris to prepare for a difficult conversation with his boss. The conversation went so well it resulted in him getting a raise!. “It’s time to call Chris.” When I’m stuck in a situation at home or work, that’s my first thought. Chris is masterful at creating a coaching space that simplifies the clutter in my mind and supports me in making a next step. Chris engages as my partner in a way that I feel challenged to face my own stories (and do something about them), yet also safe to be honest and vulnerable. She has my back. That means she calls me on my stuff in a way that I can hear it, and at the same time, I feel loved and supported to bring out my best. Chris is authentically human, deeply connected, passionate about her calling, real. Through our often raw and sometimes even humorous coaching conversations over the years, Chris has been my travel partner through relationships, job changes, personal discovery and even the death of important people in my life. I’m glad she’s here. I’m a better person on the planet because of her. If there were a single person I would want so desperately to describe, and yet feel so inadequately short of words every time, it would be Chris Trani. I came to Chris in the midst of facing my mother dying of terminal cancer, while simultaneously fumbling through significant life changes, including struggling to navigate an ‘off-and-on’ relationship, as well as coming out as a lesbian to a harshly conservative family and community. She helped me bring clarity to the difficult conversations going on inside of myself, and more miraculously, the difficult conversations that needed to be had with my dying mother, loved ones, and those around me. Chris honored my life as a complex whole, while simultaneously helping me free myself from the overwhelming tangles of it all, and guided me to navigate each piece as it’s own. She helped me make my path. . . not just one that was less overwhelming, but one now equipped with tools that allow me to more gracefully explore life, and forever appreciate it as a predictably difficult, but beautiful journey full of endless possibilities.